100% metal-free Ceramic implants have been through rigorous clinical trials and are now approved for use by Health Canada. When an individual is faced with the decision of replacing a natural tooth with a dental implant, answers to some of their concerns may help them decide what type of implant they will choose. One of these newer alternative materials that have been introduced into the field of restorative dentistry is a metal-free ceramic material called Zirconium Oxide (Zirconia). For those who have an allergic reaction to metals in, or on contact with their body, or feel uncomfortable with the concept of inserting any type of metal into their mouths and would prefer a non-metal solution, there is now another choice of material other than titanium. A Zirconia implants also has a natural white color due to its ceramic material composition which, for esthetic reasons, might appeal to some . 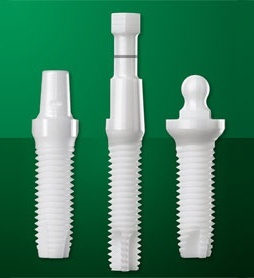 The choice is yours – the option of a metal-free ceramic implant is now available to you. Only the actual tooth is more natural.